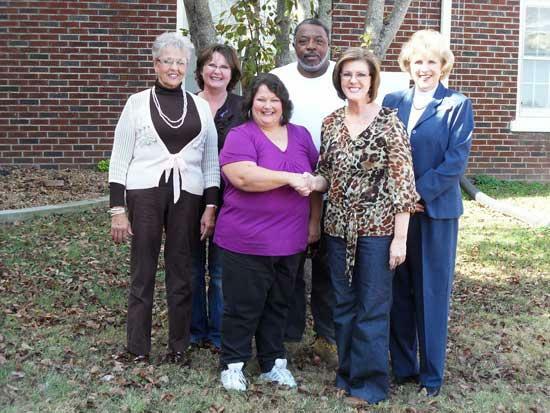 Pictured left to right back row: SAVE Counsel on Agency Office Worker: Shirley Borren, SAVE Board Member and Volunteer: Tina Campbell, SAVE Board Member and Volunteer: Leroy Brandon, SAVE Board President and Volunteer: Wanda Parker Front Left to Right SAVE Director: Lisa Baird and Cannon County MTEM Representative Kim Mullen. Cannon County SAVE Domestic Violence Agency would like to thank everyone at Middle Tennessee Electric. SAVE recently received a $5,000.00 grant from Middle Tennessee Electric Customer Cares. The funds will be used for numerous agency needs such as client services, office supplies (fax/copier/printer), education, and other general office operations that will help us better serve victims of domestic and our county. The funds are a true blessing to this agency and the victims we serve. Funding for domestic violence is always an issue. Without private donations, fundraisers and grants such as Middle Tennessee Electric victims of violence would have no where to turn. Again SAVE would like to express our gratitude to everyone at Middle Tennessee Electric for their support.